Eight percent of Internet users say they will stop using Facebook because of news about Cambridge Analytica’s abuse of users’ personal data, according to findings of a national survey distributed to investors this morning by securities firm Raymond James. 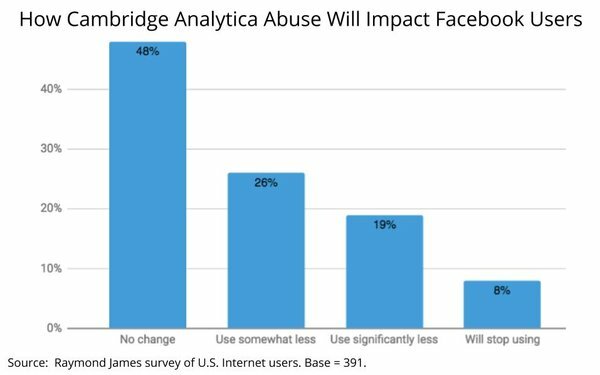 The analysts surveyed a sample of 500 Internet users in the aftermath of the revelations, and asked them a variety of questions, including how concerned they are about the abuse and how it will impact their use of Facebook. Forty-three percent said they were “very concerned” and 31% said they were “somewhat concerned” about Cambridge Analytica’s breach of Facebook data. 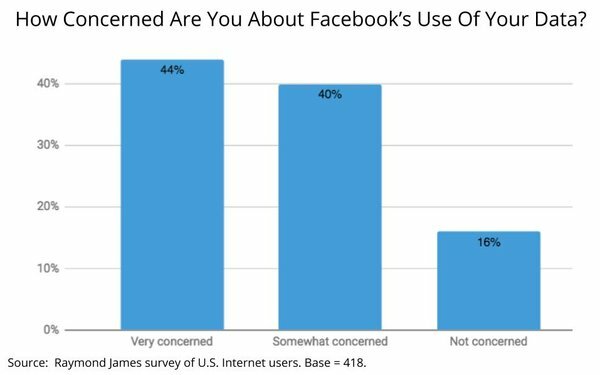 While only 8% said they would stop using Facebook because of it, 19% said they would use Facebook “significantly less” and 26% said they would use it “somewhat less” because of the incident. “We believe these user concerns could ease as the news cycle slows on this topic,” the analysts opined in the report.